Looking for an edible flowers list? Edible flowers are fun to grow, and, of course, to eat in salads or use as a garnish for plates or festive desserts. This edible flower list gives you some ideas about the wide variety of flowers that can safely be consumed. Most flowers taste better when used raw, but others, such as okra and sunflowers, are delicious cooked as well. When cooking flowers or adding them to a finished dish, remember that most flowers are delicate and excessive heat will cause them to lose their flavor. 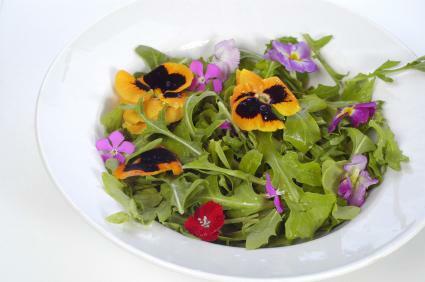 Edible flowers make a wonderful garnish floated in soups, on salads, at the side of a plate or on desserts. Consider "sugaring" edible flowers when you use them to decorate pastries. First, don't use flowers that aren't edible on or near food. If you aren't sure if a flower is edible, don't use it. Use the edible flowers list above as a guide when making your choices. People will assume that a flower is edible by virtue of its being placed on a plate. Always know where your flowers are coming from. Growing them yourself is the best possible way to get your flowers because you know that nothing has been sprayed on them. If you can't grow your own edible flowers or just need to buy some extras, make sure they were organically grown and had no pesticides used on them. Flowers can be difficult to clean so this is really the best option. Before using any flowers from the edible flowers list, shake them gently while holding them upside down to make sure there are no bugs in them. Remove the stamen and rinse them gently in a sink or bowl of water. Allow them to dry outside of direct sunlight. The faster they dry, the more flavor will be retained. Edible flowers may be stored tightly sealed in a container or wrapped in plastic. You can also keep flowers on their stems stored in the refrigerator in a glass or jar of water. If your flowers have wilted before you want to use them, place them in a bowl of ice water for a few seconds.